Video Blog - Who should you call first? The Realtor? Or the Lender? VIDEO: What Comes First? The Realtor? Or the Lender? Check out the video for a little more detailed answer, and please share it, like it, retweet it, and comment on it. I’d love to get a conversation started. But if you’d prefer to read as opposed to watch, here’s my take: If you’re thinking of buying a home, and you have no idea who you’re going to use as a mortgage lender (and by the way, saying, “Eh, I’ll probably just talk to somebody at my bank,” is not an answer you should tell yourself – seriously, don’t) , then my suggestion would be to find a Realtor first. Already know a good Realtor you trust? Perfect! Talk to them, and they’ll get you in touch with a mortgage lender they have had success with in the past and trust themselves. Don’t know a lender or a Realtor? Find a Realtor by asking around. Ask friends. Ask family. Ask Facebook. Ask Twitter. Ask the guy in the produce department at Whole Foods. Just find a good referral for a Realtor that someone you trust has used and enjoyed working with. And then again, let that Realtor put you in touch with a lender they’ve used in the past and have had success with and trust. 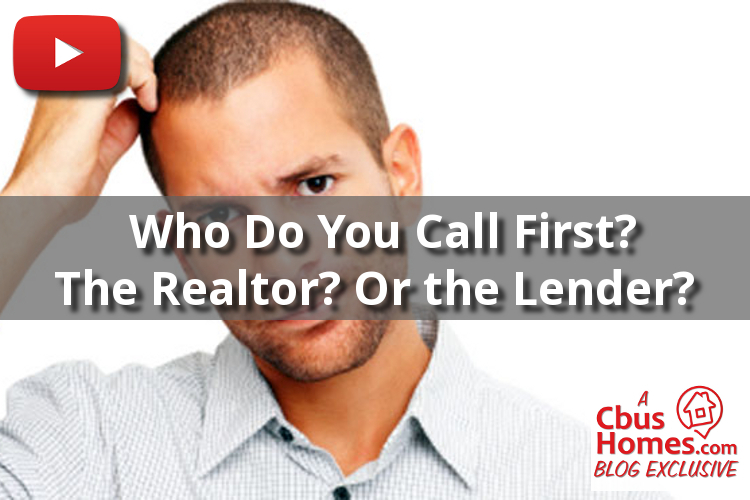 So really, the only time I’d recommend calling a lender before a Realtor is if you already know a lender that you trust. Maybe you’ve worked with them in the past. Maybe they’re a friend? Maybe they’re your cousin. You know you can rely on them to take care of you. Then, you can call them.